CHARLOTTE — Democratic National Convention (DNC) organizers have repeatedly stressed the "inclusiveness" of the event, but that apparently does not include supporters of statehood for the District of Columbia (D.C.), who were denied speaking slots and relegated to the outside of the convention. For the third DNC in a row, language explicitly supporting D.C. statehood was conspicuously absent from the party platform. 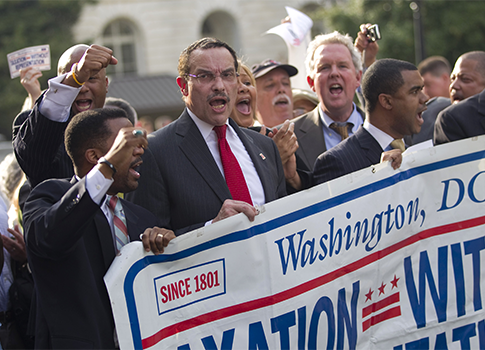 Meanwhile, no speaking slots were given to supporters, and activists trying to hold a rally for D.C. statehood—including D.C. Mayor Vincent Gray—were blocked by police. "We’re pretty damn pissed," Kesh Ladduwahetty, the former chair of DC for Democracy, told the Free Beacon. Ladduwahetty also said President Obama has been "lousy" on the issue. "He’s worse than Bill Clinton when it comes to statehood," she said. A coalition of statehood and voting-rights groups had been approved to hold a rally Tuesday in a fenced-in "free speech zone" outside of the convention center, but police cordoned off the area due to a nearby Occupy protest. The statehood activists, including D.C. Mayor Vincent Gray, were unable to cross police lines to reach their approved freedom cage. "I’ve been trying to get in the area for 45 minutes," Gray told reporters amid a throng of nightstick-wielding police. "And of course by the time we got here, it was over. I guess that’s a metaphor for the whole thing." Organizers and police only gave the statehood activists 30 minutes for their rally and refused to allot any extra time for them. Delegate Eleanor Holmes Norton told the Washington Times that this is the first convention in 20 years that D.C. statehood activists have not received a speaking slot. "Failing to give the District of Columbia a voice at the convention this year, in particular, is a bitter pill to swallow," she said. The Democratic Platform included language supporting statehood for the District for 16 years until 2004, when it was unceremoniously dropped. District of Columbia residents lack voting representation in Congress. The District also lacks autonomy over its own budget, which must be approved by the federal government. While this year’s Democratic Platform ignores statehood for D.C., it does endorse voting rights and budget autonomy for the District, saying all citizens "should have full and equal congressional rights and the right to have the laws and budget of their local government respected without congressional interference." This entry was posted in Politics and tagged Congress, DNC, Eleanor Holmes Norton, Media, Vincent Gray. Bookmark the permalink.